Posted by OromianEconomist in #OromoProtests, Africa, Human Rights, Oromia, Oromo. Terrorist and Criminal attacks targeting Oromo youth, and children, and even pregnant women have continued unabated since the peaceful protest for justice and freedom began on 12th November 2015 In Oromia.The peaceful and legitimate protests against the injustices in Oromia, in which Oromo people of all walks of life have participated, had a simple and clear demand at the beginning: ” Stop Addis Ababa”s Integration of the Master Plan, and stop land grabbing in Oromia”. Instead of responding justly to the protestors’ legitimate grievances and restoring their domestic and international rights, the Ethiopian government has chosen to deploy its special squad “Agiazi” and mercilessly crack down on the peaceful protesters. The ruthless Agiazi force used excessive force, killed many promos, beat and detained thousands to stop the protest, which spread to all corners of Oromia Regional State in a few weeks. Oromia towns and villages were turned into war zones as the special Agiazi force continued its random killings of students, children, men and women. During the first two months of the peaceful protests, more than two hundred (200) Oromos were murdered, including infants and pregnant women. In violation of the “Convention on the Rights of the Child” and other international treaties the current government of Ethiopia ratified on 14th May 1991,(see the other treaties ratified by the current of Ethiopian government from the link) Oromo children, including non-schooled children, have been killed by the Agiazi force. Aliya,15 and her brother Nagassa, 8 (photo on right side) were shot in the leg on March 25, 2016 on the streets of Ambo town. Many minors/teenagers were killed and others wounded. by the Agiazi force in different parts of Oromia. Some are listed in the following table. These cruel and inhumane actions of the Agiazi force against Oromo did not stop the angry protesters from demanding their fundamental rights and freedoms. The merciless Agiazi force has been allowed officially to quell dissents in Oromia by force. 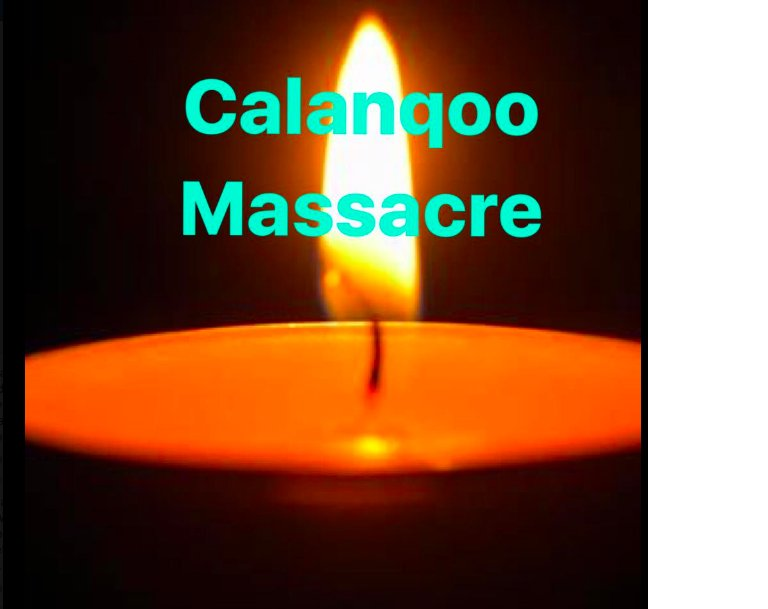 On the day following the martial law declaration, the Agiazi squad started breaking into private homes and savagely started to kill and beat children, men and women, including pregnant women. On February 27, 2016 a seven- months pregnant mother of six, living in the West Arsi zone in Oromia state in Ethiopia, was shot down in her home by security forces who had come to her home looking for her husband. 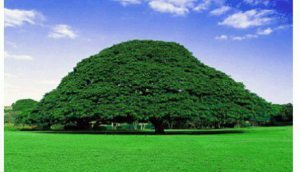 Another six- months pregnant woman Shashitu Mekonen was also killed and thrown into the bush in Horro Guduru Wallega, Oromia. The Agiazi murderers intensified their repressions in all corners of Oromia. Since the November 2015 peaceful protest began, over 400 Oromo nationals have been killed, over fifty thousand (50,000) arrested and placed in different police stations, concentration camps, and military camps. Unknown numbers of students have been confined in the Xolay concentration camp where they are exposed to different diseases because of poor diets and sanitation. No medical attention has been given them and a number of prisoners are dying each day, according to information leaked from Xolay concentration camp. This represents the systematic elimination of the Oromo young generation. The late prime Minister Meles Zenawi, the architect of the current TPLF Empire, in 1992 vowed to destroy those he considered major threats to his rule, particularly the most populous nation in the country, the Oromo. He vowed to reduce Oromos to a minority and take over their natural resources. The longest protest (in terms of weeks and months) in the history of Ethiopia has been slowed down by the military crackdowns. When protestors returned home from the street, they started facing another form of atrocity. They were forced day and night to stay indoors, in a kind of house arrest. At night, the Agiazi force would walk into individual homes and pick up youth and kill them, leaving their dead bodies in front of their doors. On April 14, 2016, a university engineering department graduate from Gonder University was cold bloodedly murdered in the Oromia Gujii zone in Oddo Shakisso where he used to live with his parents. Since Oromia is now under martial law, information, coming out of the Regional State of Oromia is restricted. All social media are being monitored by the military administration. A number of cell phone users were arrested and their phones taken. Gross human rights abuses, killings, arbitrary arrests, torture and other human rights atrocities are happening in Oromia every day and night. However, the information about these atrocities is not getting out, because the military has monitored almost all information outlets. The Ethiopian people hear only the well- crafted stories about Ethiopia being on the path to democracy. These stories come from the government mass media. International and domestic human rights organizations have been reporting the atrocities, although their access to information in Ethiopia is very limited due to their researchers being banned from entering the country. But undercover investigative journalists still bring out the news of the genocide and ethnic cleansing committed in the name of development. 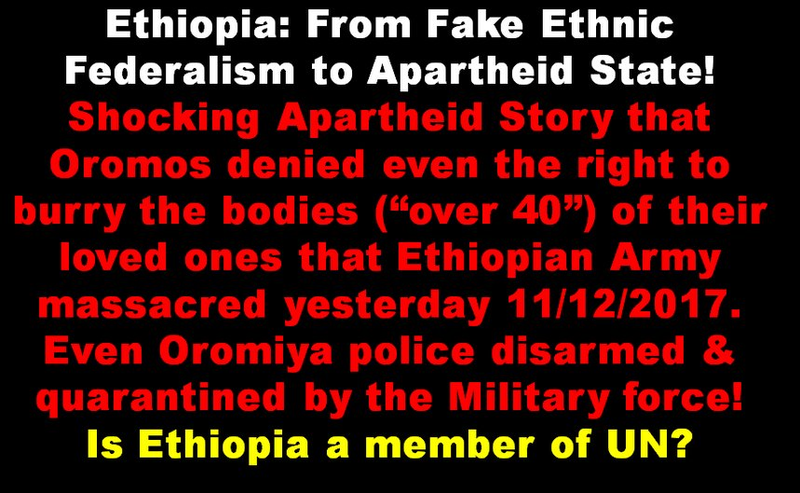 The current human rights atrocities in Oromia have been condemned by some western governments and government agencies, notably the EU and the USA, and UN experts/researchers. But still no meaningful action has been taken to stop the atrocities in Oromia. When the regime has been pressured enough, they do make concessions and acknowledge the legitimacy of the protestors’ grievances. Indeed the Prime Minister, Hailemariam Dessalegn, has been known to apologize to the people. However, all this seems to be political posturing to deceive the world that is becoming increasingly aware of the atrocities. On the ground, there is no sign of the atrocities abating. There have been no gestures of conciliation. The regime’s force has actually stepped up its mass murders, mass incarcerations and mass rapes. What is puzzling is that after all these tragedies, the world donor countries and organizations are still silent. It seems surreal. How many people must die before the world responds? How many millions must be jailed and tortured, how many must be gang- raped before this deafening silence is broken? Can’t the world community learns from what happened in the past, in Rwanda in 1994, in Bosnia, in 1998 and what is happening in Syria ever since 2011? The genocidal act of armed force should not continue and must be stoped by someone, somewhere. HRLHA is deeply concerned that if International Communities fail in responding to the merciless killings presently taking place in Oromia Regional State as soon as possible , this could lead to a genocide comparable to those in Rwanda (1994), in Yugoslavia (1998) and in Darfur, Sudan (2003). Therefore, the HRLHA respectfully demands that governments of the west, especially who allies with the Ethiopian government to break their silence about the TPLF hidden agenda of promoting systematic genocide against the Oromo and other nations in Ethiopia and act swiftly as possible to halt the atrocity in Ethiopia. Intervene to stop the killings in Oromia using the mandate of the three pillars of the responsibility to protect, as stipulated in the Outcome Document of the 2005 United Nations World Summit (A/RES/60/1, para. 138-140) and formulated in the Secretary – General’s 2009 Report (A/63/677) on implementing the responsibility to protect.